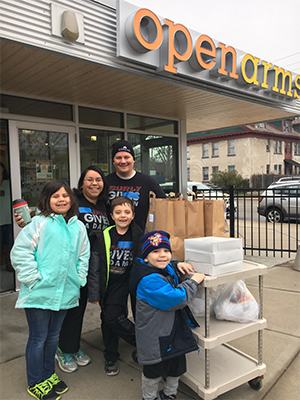 You can help provide Thanksgiving dinners for families in the Twin Cities living with life-threatening illnesses. Thanksgiving is a very special day at Open Arms of Minnesota. For more than 30 years, this holiday has been an important chance to show people living with life-threatening illnesses in the Twin Cities that someone is thinking of them, particularly those who don't otherwise have a support network. 1. Those who feel up to cooking receive a high-quality frozen turkey with all the fixings. 2. Those who are too sick to cook get a ready-to-enjoy turkey feast delivered on Thanksgiving Day. We invite you to participate in the 11th annual Turkey Drive to sponsor these special holiday deliveries! 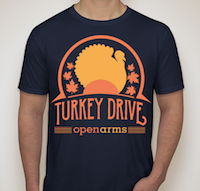 Every $50 sponsors a Thanksgiving feast for an Open Arms client living with a life-threatening illness so they can enjoy a turkey dinner with their loved ones. 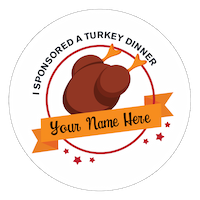 For every turkey dinner you sponsor for a client, you'll get a special badge on the wall at Open Arms with your name on it! 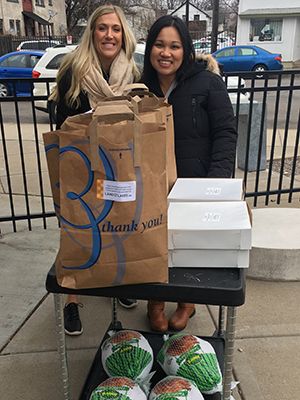 You can make an even bigger impact for our clients this Thanksgiving by spreading the word about the Turkey Drive to your friends, family and coworkers! Raising money for Thanksgiving dinners is fun and rewarding, as you're making a direct impact for our clients this holiday season. We'll provide you with a personalized turkey page for donations and plenty of tips and tools you can use to spread the word to your network. Along the way, you'll also compete in weekly drawings for freshly baked pies from the Open Arms bakery, coffee, gift cards and other goodies to make your Thanksgiving table extra festive. By joining the Turkey Drive, you'll get a special paper turkey with your name on it on the Turkey Track hanging in our building, a record of the competition. 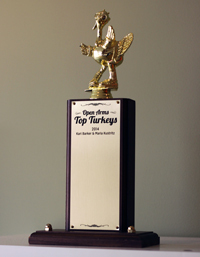 As you fundraise, your little paper turkey will compete against all the other fundraisers for the ultimate grand prize: your very own Turkey Trophy to take home and your name inscribed on the permanent Turkey Trophy displayed at Open Arms. If you'd like to get your friends, family or coworkers involved, we can set up mini-competition for your group so that you can compete against each other and have fun while raising money for a great cause. Email angie@openarmsmn.org to learn more. “Thank you for the fabulous, amazing, magnificent, tremendous, excellent, marvelous, and spectacular Thanksgiving dinner delivered to my door on Thanksgiving day. I cannot tell you how wonderful that dinner was. What can I say, but thanks, ever thanks, and thanks again."